Well, another trip to Colorado is in the books. This year’s trips presented us new challenges and excitement. Water was in short supply this year, and that was both good and bad news. 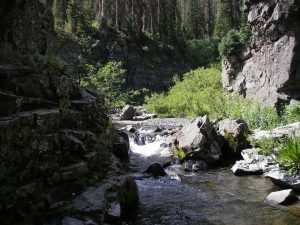 The good news was that the low water made the Rio Grande very accessible for the fly angler. 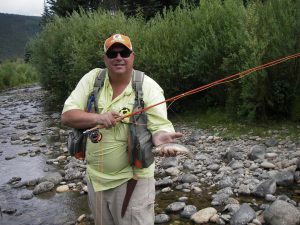 The bad news was the state’s recommendation not to fish the river past noon, due to high water temperatures. A good number of the trip goers took advantage of the low water, and did very well, catching healthy rainbow and brown trout. The upper portion of the river fished the best, but spots closer to our South Fork base did well, too. The feeder creeks were also lower than normal, but that did not interfere with the many nice-sized browns that were looking up for dry flies or looking down for big nymphs. 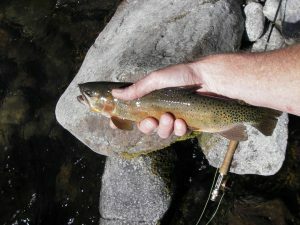 The higher elevated creeks produced many beautiful cutthroat trout, which were in full color. For me, catching these beautiful trout was the highlight of the week. The wildfires never affected our plans, but did alter our routes some. We drove home through the remnants of the Spring fire, which took out over 115,000 acres of forest. It was sad to see that one careless individual could cause so much damage. 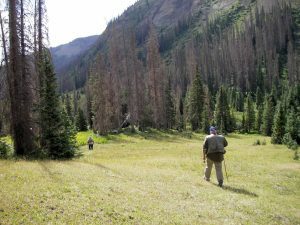 It is so important to adhere to the warnings that the U.S. Forest Service puts out. This is the third wildfire that I have seen in the South Fork area, and it will most likely not be the last. It takes so long for these areas to recover from a fire of this size. So please, please be very careful when spending time outdoors. On a happier topic, evenings were filled with the aroma of good food and time spent discussing the day. We even had some great music played for us by Bruce and Larry that brought us all together after a full day of fishing. A few booked some of the local guides for some enhanced experiences. Great results came from these trips, and I always recommend hiring a guide for those that are new to an area or need additional assistance. Leaving to go back home is always a bummer. But this year, temperatures in Colorado when we left were in the high 40’s, low 50’s, while temperatures in Texas were well in the 100’s. Today was 110!!!!! When can we go back? Plans are already in the works.